Suspended in space and time, the mysterious characters who have made Giorgio de Chirico’s Metaphysical art so famous were reproduced over and over again, not only in graphics and paintings but in 3D versions, works of sculpture with which the general public is probably not yet familiar. Less well-known than his paintings but no less evocative, the great master’s sculptures offer an opportunity to take a closer look at some of the subjects that have dominated his artistic career, including the enigmatic presence of manikins and the persistence of the myth and memory of the ancient world. De Chirico did not approach the art of sculpture until around 1940, when the already mature painter began to make little painted terracotta pieces in which he went back to the themes of his Metaphysical period. Later on, the artist translated these fragile pieces into longer-lasting bronze sculptures, producing small runs in different sizes. 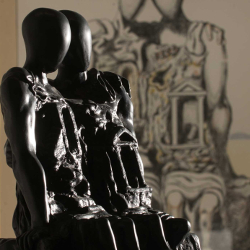 The corpus of his plastic works was later re-released by Fondazione Isa e Giorgio de Chirico of Rome, commissioning the casting of a new limited edition to mark the centennial of the artist’s birth in 1988. To present to the public an important core collection of 19 of these sculptures, recently added to MAGI’900’s permanent collection along with a number of valuable graphic works, the museum is holding a special exhibition comparing De Chirico’s two-dimensional works with the versions he constructed in the round. The works on exhibit will include a number of key figures from De Chirico’s imagery, such as Archaeologists, Troubadours, Colonial Manikins, Muses, and Horses, themes presented in a number of versions offering one of the most comprehensive overviews of Metaphysical sculpture ever held in Italy. The bronzes, exhibited with a preparatory chalk, paintings, drawings, graphics and two rare illustrated editions of the Book of Revelation, are on show before the public in a choral exhibition made particularly intense by an installation of luminous panels from Museo Documentario della Metafisica in Ferrara, a pioneering “virtual” museum opened in the early ’80s and no longer in existence. Based on a concept by the late Franco Farina, to whose memory the exhibition is dedicated a year after his death, first expressed when he was director at Palazzo dei Diamanti, the Museo Documentario was an advanced, forward-looking experiment in the promotion and dissemination of Metaphysics. Its location in the centre of Ferrara was particularly appropriate as the city played a key role in the rise of the artistic movement in 1917, when De Chirico met Carlo Carrà and the pair frequented Filippo De Pisis and Giorgio Morandi in Ferrara. And while Ferrara has remained the most Metaphysical of cities, a subtle twist of fate has now assigned Pieve di Cento a minor role in the telling of this story, not only because of the presence of this important collection but also because, as the exhibition reminds us, Carlo Carrà spent a number of months in the town when he first began his military service there, before being transferred to Ferrara. The installation is set up by Valeria Tassinari. Claudio Spadoni and Lola Bonora will speak at the opening.